Mini Two Strand Twist is my ultimate protective style. I love this style. It takes me a while to do, but it lasts for up to 4 weeks! I don’t need to do anything to my hair during that time. It’s truly a shake and go style. I co-wash my hair about once a week and I spritz with a conditioner (V05 Moisture Milk or Suave Naturals), water, jojoba oil mix daily for moisture. I chose to blow dry my hair prior to starting. After washing my hair, I braid in four braids and let them air dry. Once dry, I use a heat protectant and I blow dry on low. This is not a required step. The style looks just as nice and lasts just as long if you don’t blow dry. I choose to blow dry in order to show the length. Use a rat tail comb and not worrying about parts, make sure you are taking just a small amount of hair at a time. Split the hair in to two sections and twist one section over the other. Keep doing this and twist the hair all the way down to the end. The twist should be a little smaller than the size of a straw when finished. I like to work with the front first. I twist starting at the hair line. I twist going towards the front. If you like a part in your hair, this is the best time to create it. Make sure you twist the entire front including the sides. Once I get to the middle of the head, I switch gears and begin working the very back. This means I end up with a big chunk in the middle that is undone. I like it this way because, if for some reason I can’t finish, I can always put the hair in a bun and it looks as though my entire head is done. I then work on the middle part. Twisting those to the back. Flip the front of the hair back when done and the style is complete. To get the ends to curl, I use my water, conditioner, jojoba oil spritz on the very ends and scrunch with my hands. Scrunching is done by cupping the ends of the hair and squeezing similar to an accordion. Add a small amount of jojoba oil to the hair at night. Tie down the hair with a satin scarf or sleep on a satin pillow. In the morning spritz the hair with the water, conditioner, jojoba oil mix. Scrunch the ends. Co-wash weekly. 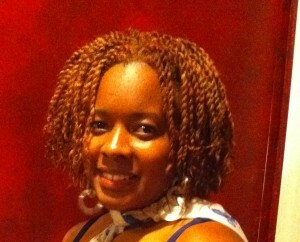 I use V05 Moisture Milk or Suave Naturals for my co-wash.
Start out by unraveling as many twists as you can by hand. Don’t worry about the ones that are really tangled. Get some cheap conditioner. I use Suave or V05 Moisture Milk. Wet the hair and add a generous amount of conditioner. I usually do this in the shower so I use the max amount of water and ensure that each section stays completely wet as I am detangling. Take a good size chunk. About 10-15 twists. Add more conditioner and take a DENMAN Brush and begin to brush out the twists. Start from the bottom and work the brush up to the top. A good amount of hair will be lost, but that is ok. Your hair has not been able to shed because it has been twisted for weeks. Shed hair is expected. Braid the section once complete and move on doing the same thing until the whole head is done. Deep condition the hair when complete.